First up this month you might remember his strange name from Palms of Steel or the New York Coin Magic Symposiums, seen him online at Reel Magic Magazine, or read his column in the pages of Genii. No matter how you know Kainoa Harbottle's material, you also know he brings with him an engaging personality, an off-beat sense of humor, and some of the cleanest coin magic you will ever see. Originally hailing from Honolulu, Hawaii, Kainoa grew up "in the trenches," performing close-up magic in the hotels of Waikiki and the outer islands. He eventually moved to Los Angeles, where he was a Junior Member at the Magic Castle, and then headed further east, teaching for over a decade in the University of Delaware's English and Theater Departments while finishing a dissertation on (surprise, surprise) magic in the nineteenth century. A scholar of magic's history and an innovator of one of its most challenging genres, Kainoa's thinking is considered revolutionary by many of his contemporaries, and he enjoys surprising other magicians by making the most difficult material look effortless. Next up we have Erik Tait, who came to the attention of the magic community when he won the 2018 IBM Gold Cups Close Up Competition. Since then, he has appeared on Penn & Teller: Fool Us and released a string of wildly popular effects. Now Erik lives in Columbus, OH and performs for Fortune 500 companies as well as performs on comedy shows and festivals across the country. In this lecture, he details some of his personal routines that he uses in his strolling work, as well as when he wants to absolutely wow an audience. This lecture contains material for all skill levels, and some close-kept secrets that will raise your sleight of hand to the next level. 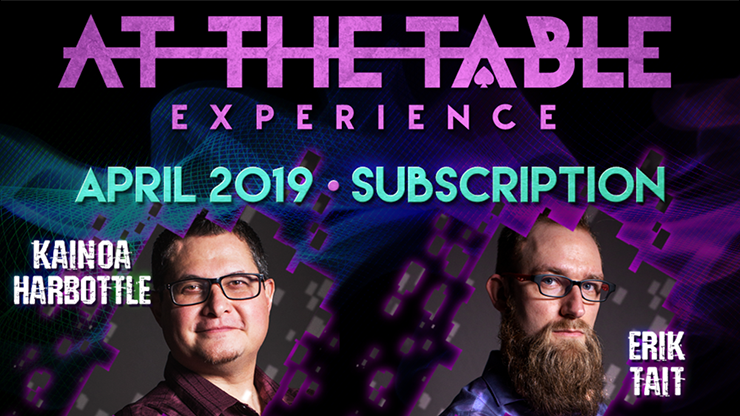 Join us in welcoming Kainoa Harbottle and Erik Tait right here At The Table.